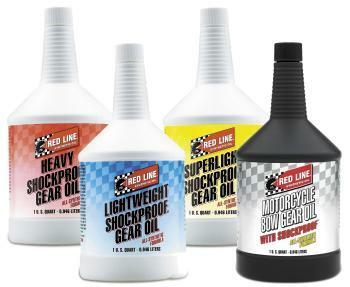 Red Line ShockProof Gear Oil is a unique lubricant containing a suspension of solid microscopic particles as an extreme pressure agent—unique solid dispersion which cushions gear teeth to help prevent tooth breakage and allows the use of lower viscosities. Acting like a liquid grease, the viscosity characteristics of Red Line ShockProof allow the lubricants to resist throwoff and provide the protection of a greater film thickness with relatively light fluid viscosity, offering a “best of both worlds” balance of low drag and superior protection. Red Line ShockProof products work in a variety of differential and transmissions, however, should not be used with pumps, filters, and with small lines—these fluids are designed wet sump or splash type lubrication. Similar to Red Line’s Heavy ShockProof, V-Twin Transmission Oil with ShockProof provides unequalled protection for both stock and aftermarket American V-Twin transmissions. Designed for applications like two-stroke motocross bikes, shifter karts, the CRF 250 450 transmission. Used where an 80W oil is called for, ShockProof’s microscopic solid medium provides cushioning between gear teeth, while maintaining lower drag. Reduces the thinning effect from high temperatures. Provides the balanced slipperiness necessary for consistent shifting and proper wet-clutch operation.